Men dressed as Jacobite warriors at Culloden. 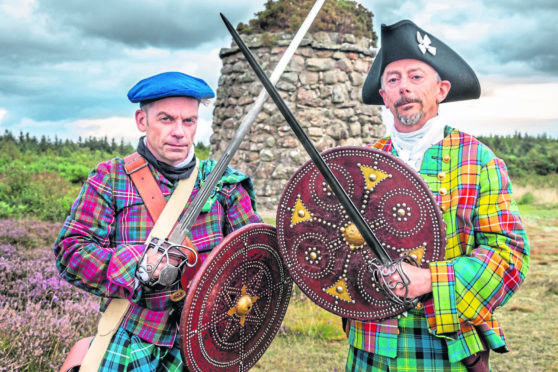 The official guardians of Culloden Battlefield have launched a public appeal to protect the iconic moor amid warnings continued development could ruin the site forever. The National Trust for Scotland (NTS) yesterday launched an appeal to the public to help them protect the moor from encroachment by developers. The trust says current legal safeguards don’t protect the area and fear unsympathetic development with plans for housing and businesses will ruin the historic landscape forever. Raoul Curtis-Machin, operations manager for Culloden Battlefield and Visitor Centre is furious about planning decisions made in the past few years which have allowed ‘development creep’ around the moor. He said: “It’s crazy to allow inappropriate development where you needn’t. “There’s a lot of space where you can develop and expand, and yes everyone needs housing – but to spoil an asset like that seems incredibly short sighted. Mr Curtis-Machin said NTS has undertaken a visual analysis of the land around Culloden and asked a landscape architect to model it with various types of development to show the public. He said: “We can then show people different types of housing development, of up to three storeys, agricultural and business buildings and ask them what they think might be acceptable. “For example, would they find a small development in a hollow acceptable, or a power line on a ridge? NTS is running consultation known as Culloden 300 from now until the end of August, alongside an exhibition at Leanach Cottage on the battlefield site. A draft document will be produced in September followed by a further consultation with the final vision to be announced in December. He added: ““The reality is that there are pressures for land in this area and what we want to achieve is a planned and positive approach that protects Culloden and what it represents to so many people. The group issued a statement yesterday saying they support the NTS initiative. They said: “We fully support this initiative but would have welcomed it five years ago when our campaign commenced after the decision by a Scottish Government reporter to approve the construction of 16 houses on the site of Viewhill Farm. “It was predicted that the commencement of building there would see other development proposals put forward. This is exactly what has happened. “We cite two current examples, Treetops Equestrian Centre application for change of use to a holiday centre and the demolition of the former Viewhill farmhouse and erection of another house on site by Kirkwood Homes. GTDSC member George Kempik posted: “Thousands need to give the NTS the message, don’t make Culloden another Bannockburn. “If they don’t have that power, we need them to have that power.